Calliope (pronounced ka LY o pea) is the name of one of the ancient Greek Muses -- the Muse of Poetry. This painting is reflective of the inate desire for us to continually create, whether it be poetry through words or a poetic creation of colors. 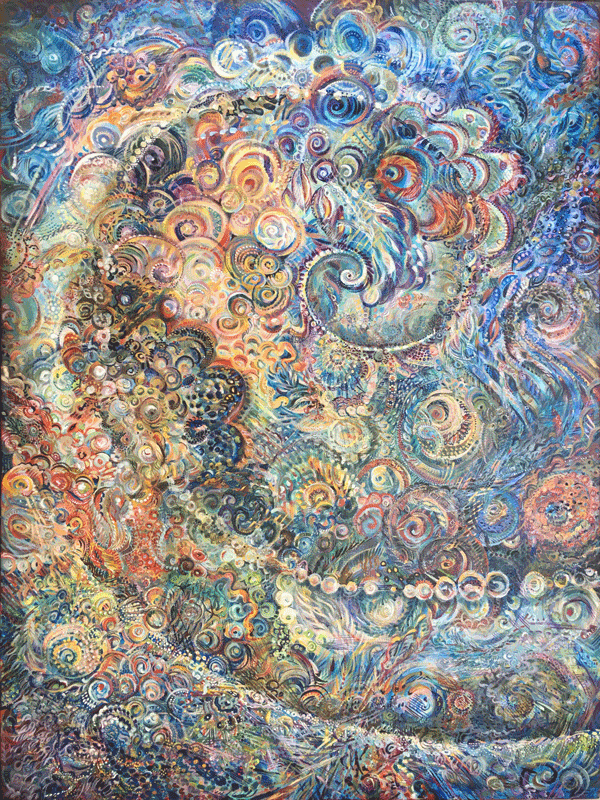 The dominant curved swirl is found throughout the natural world and is a common theme in SusieQ's work. This colorful image is one of the few that the artist has been updating annually since it began in 2007. The level of detail is extraordinary. In 2019 it became the basis for her first print on fabric as part of her SusieQ Couture line "Art in Motion". Prints are available and FOB Broward County, Florida. Shipping is extra and the artist will be happy to give you a quote. Call for size and print type requested. Available on aluminum, plexi, paper or canvas. Ready to hang.